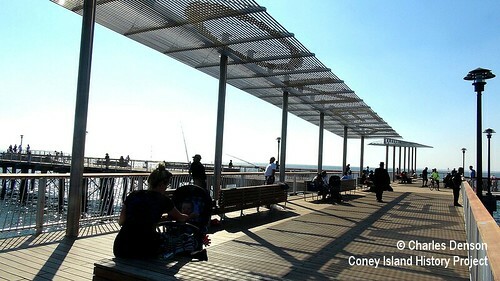 Coney Island’s Steeplechase Pier, which has been under construction since March, was inspected and reopened today to the delight of visitors enjoying the summery weather. The reopening happened without any official fanfare nearly a year after the pier was damaged during Superstorm Sandy. Today, the construction workers simply left for the last time and the sunbathers, fishermen and photographers returned to their usual spots and found some new ones, including the wave-shaped bench seen above. Among the first to set foot on the sleek new pier was the Coney Island History Project‘s Charles Denson, who shot these amazing photos. New amenities on the 1,000 foot long pier include a communal lounger made of wave-shaped wood and a variety of seating options. The wood on all the benches as well as the handrail wood is reclaimed ipe from the old decking that was on the pier. 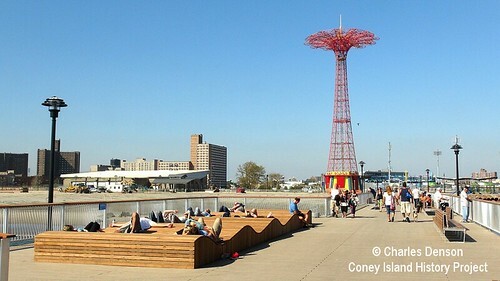 There’s also a shade structure with letters spelling out CONEY ISLAND that cast an elegant shadow on the pier and can be viewed from above by seagulls, helicopters and the gods of the air. LTL Architects custom designed the benches as well as the overhead screens. Their redesign for the reconstruction of the pierwon Special Recognition at the 31st Annual Awards for Excellence in Design by the New York City Design Commission. Vibha Agarwala of LTR Architects told ATZ the construction is complete but there will be some final touches, including bait cutting stations. The work was carried out by T.B. Penick and their New York division Triton Structural. The construction company was awarded projects totaling $120 million for repairs to New York City’s Superstorm Sandy damaged beaches. Over the weekend, word on the Boardwalk was that Steeplechase Pier, which has been under reconstruction due to damage sustained last October during Superstorm Sandy, would reopen this week. 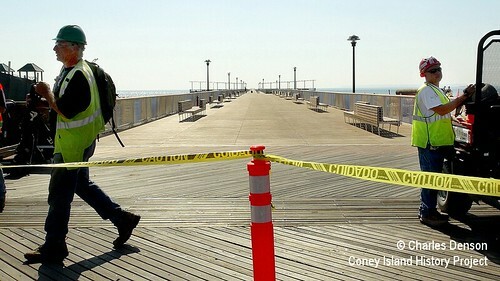 The Parks Department confirmed the pier would open soon but did not announce a date. October 29, 2013 will be the anniversary of the storm surge that devastated Coney Island. 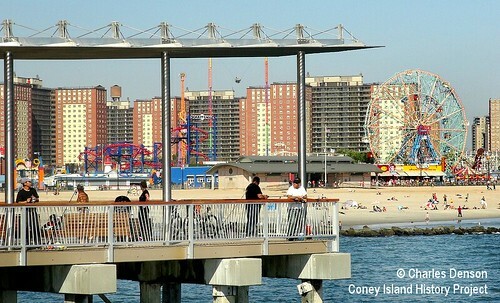 Steeplechase Pier had to be completely reconstructed post-Sandy and was originally expected to be finished by July. The rebuilt pier and the landmarked Parachute Jump are the sole survivors of Coney Island’s Steeplechase Park, which closed in 1964. Yes, I just returned from there. They did a great job. The sunset was spectacular too, just perfect for the reopening. Saw your photos on twitter. Lovely! the pix prove we can make it!! Thanks, Jack. Looks like pier is going to be more popular than ever!